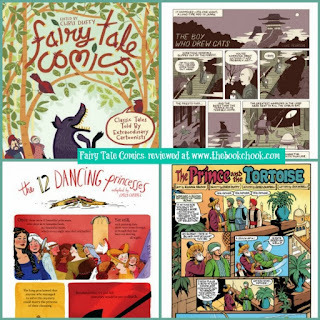 I have to admit, I was very excited after reading Sterg Botzakis’s review of Fairy Tale Comics at Graphic Novel Resources. Two of my favourite things, great graphic art and fairy tales, all wrapped up in a bookish bundle? SWOON! Luckily, the publishers were keen for me to review it too, so they sent me a copy. Part of me wants to pass my review copy on to my favourite local library, but sadly, there’s a greedy chook who wants to keep it all to herself. Fairy Tale Comics: Classic Tales Told by Extraordinary Cartoonists was edited by Chris Duffy and published by First Second Books, 2013. You can find this hardback volume online via Amazon or Book Depository where it’s currently $Au24.31, with free postage to Australia, UK, USA and many other countries. The stories in Fairy Tale Comics twist, bubble and pop from the pages. It’s hard to choose favourites, but I know I guffawed in Puss in Boots and giggled over The Prince and the Tortoise. I already knew and admired Gigi D.G from Cucumber Quest, and I enjoyed the classic simplicity of the writing and art in her version of Red Riding Hood. Children will find such a range of stories and comic art styles in Fairy Tale Comics, that it’s sure to be a book they will read over and over. Little Red Riding Hood – Gigi D.G. 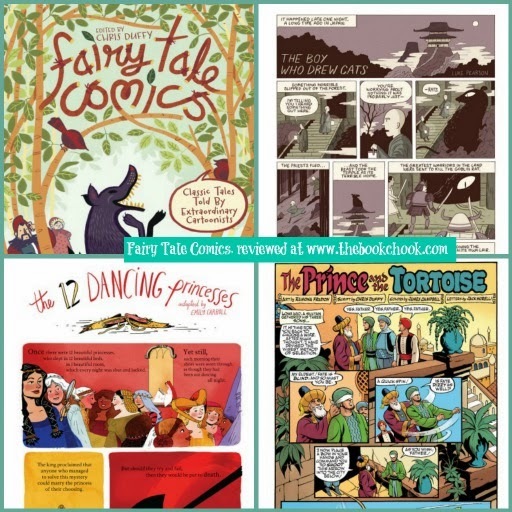 I believe Fairy Tale Comics makes a stunning resource for school and community libraries. Many, many children are interested in graphic novels, comics, manga etc - I think they'll love it. Fairy Tale Comics gives them such an interesting perspective on the way different artists interpret similar themes. When kids are set to read fairy tales as part of their literature studies, here’s one that has many old favourites, as well as some new ones from around the world. There’s lots of reading to make parents happy, but it’s not daunting text, making it ideal for reluctant readers too. There was nothing in the book that I found offensive for kids say 9+, but be aware that it’s not a sanitised version of fairy tales. Some of them retain the hint of darkness that made the originals so compelling. You might also be interested in reading Let's Celebrate Fairy Tale Day! and Fractured Fairy Tales. Great idea about the Cybils, Reshama!